What are the ticketing fees? One World is a 501(c)3 non-profit organization. Our mission is to present diverse, unique music & cultural arts in an intimate, up close & personal setting to our community. We are dedicated to providing the highest level of service to our patrons. In order to accomplish this, a fee is added to each ticket which will be used to support costs associated with each performance and maintenance of the venue. A Ticket Fee of $11 ($3 for children’s shows) is added to the base price of each ticket before checkout. This is the portion of the ticket price that covers third party box office fees, parking fees at the venue, credit card fees, labor, facility maintenance and improvements, phone fees, and more. Our 300-seat venue has overhead costs similar to facilities that have 10 times the capacity and gross potential, but don’t provide free onsite parking like we do. A portion of your service fee goes toward improvements to our facilities. Supporting our shows not only helps us to continue to bring great artists to Austin, but also supports community services like providing free tickets to underserved families and organizations that serve the underprivileged, booking multicultural arts-in-education programming for Austin schools, scholarships for young musicians to the Berklee College of Music, scholarships to our summer camp for military families, and many other services. PLEASE NOTE: When ordering online the Ticket Fee is not included in the base ticket price you see when selecting seats; it is added in the Order Confirmation/Payment page once you have added seats to your Shopping Cart before final checkout. Please keep this in mind when selecting your seats online. It is not possible to avoid paying this fee by purchasing tickets in person at the box office. Do you serve dinner at your shows? Generally, all of our shows offer an optional dinner, although we do occasionally have shows that do not have a dinner option available. When purchasing tickets to shows that have the dinner option available, you can select between the DINNER or NO DINNER option for any of your tickets, regardless of location, price, or performance time. Please note that dinner begins serving 90 minutes before showtime. To log into your account and view your transaction history, as well as reprint tickets click here. If you are unable to print out your Print At Home tickets, or you have lost your tickets, please stop by the box office the night of the show, and we will be happy to reprint your tickets for you. How do get in contact with our Box Office Administration to resolve a problem? All sales are final. No refunds or exchanges will be permitted unless the show is cancelled or postponed. What Ticket Package Memberships are available? Currently, the only membership available is our Platinum Membership, which requires the purchase of a ticket to all of our adult shows, with a 15% discount on the base ticket price. On average, we book between 65 – 80 shows annually, split between two overlapping seasons (season brochures are typically sent out in March and September). Maintaining a Platinum Membership allows you to ensure that your choice of seat(s) are reserved for any new shows that are added. 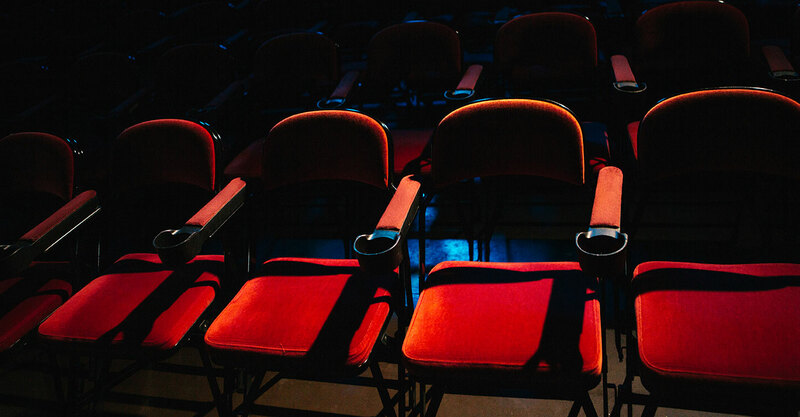 After the membership discount, a single house seat costs approximately $3200 annually, and a single prime seat costs approximately $4000 annually, depending on how many shows are actually booked in any one year. The theatre begins seating patrons about 30 minutes before show time, as listed on your tickets. The artist will begin performing very shortly after show time, so please don’t be late! Pre-concert live entertainment from one of Austin’s local musicians and our Full Service Bar open 90 minutes prior to show time. Please come enjoy a drink with us before the main performance. The Omni Barton Creek Resort & Spa, Hotel Granduca Austin, and the Sonesta Bee Cave Austin Hotel, are the closest hotels to One World Theatre. Please click here to purchase a gift certificate. Our theatre is located on the second floor of our main building. For directions to the handicap-accessible entrance and parking, please speak with our parking attendants when you enter. Handicap assistance is also available for transport from the lounge to the theatre. Please inquire at the Box Office for assistance. Once inside our friendly ushers can help you to your seats. Our bar and lounge are located on the first floor of the main theatre building. There is an additional bar in the theatre. The Box Office/Will Call booth is located in the corner of the lounge. Can I bring drinks into the theatre? Yes, you can bring drinks into the theatre from the bar on the first floor. There is also a bar in the theatre where you can get drinks. Please note that the bar downstairs closes shortly after the start of the evening’s last show, unless there is an intermission. Are there nearby restaurants for shows that do not come with dinner? Please click here for listings of some nearby restaurants. On-site parking is free. Follow the directions of our parking attendants when you arrive. If you have any questions regarding handicap-accessible parking, please feel free to inquire. What are the hours of operation and directions? Do you offer deals for group sales? Yes, we offer discounts of tickets purchases of 20+. Please fill out our Box Office Contact Form so we can accommodate your group. Please click here to join our email list. What is the theatre’s layout? 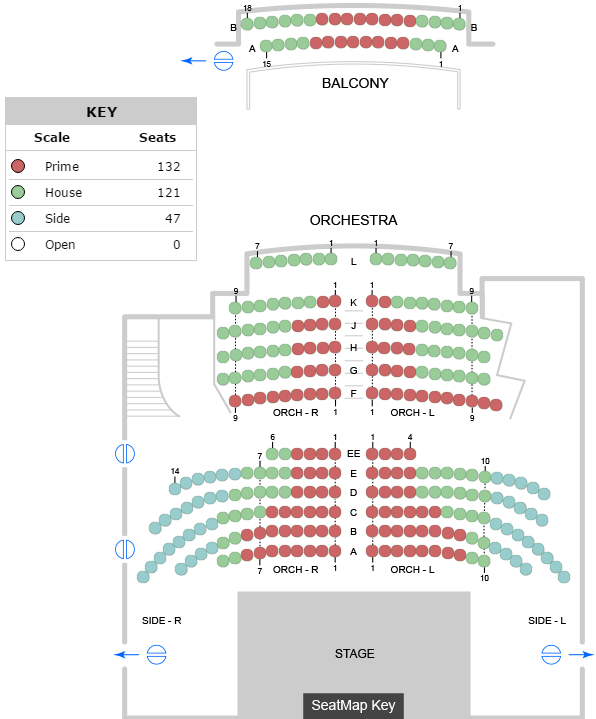 Please click here to see a general layout of the theatre. 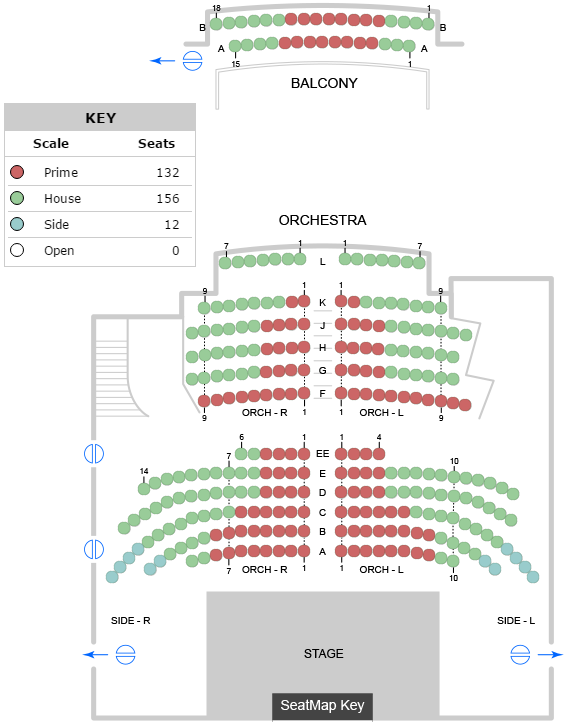 The majority of our performances are setup with 12 side seats per performance, as shown here. Occasionally, we will have shows setup with 47 side seats per performance, as shown here. Many artists prefer that no photos or videos be taken during their act. If the artist has permitted photos or videos to be taken, and announcement will be made shortly before the show starts. Please do not take photos or videos unless you are sure it has been permitted. You can always check with one of our ushers if you are unsure. If photography and/or videography have been allowed, please remember to be considerate of the people around you. Given the small size, and intimate setting at One World Theatre, taking photos could quite easily distract the people seated nearby. Yes, but please be considerate of other patrons when entering the theatre and locating your seat.